Ronaldo's second strike (in the 72nd minute) AND FUNNY 'DO clinched the title. 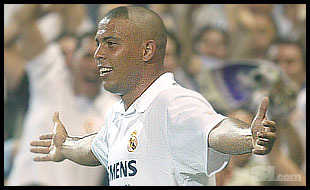 Two goals from Ronaldo and one from Roberto Carlos gave Real Madrid its 29th Spanish league title on Sunday. The 3-1 victory over Athletic Bilbao was the win Real needed to stay two points clear of Real Sociedad, who had to settle for second spot despite a win against Atletico Madrid. I'm now dancing Balki Bartokomous' Dance of Joy.